The Mountain Dhaulagiri located at the western part of Nepal is the best destined area for trekking. Trekking in Dhaulagiri is a bit hard as it includes 15 different peaks above 7000 m.
Dhaulagiri trekking offers you an ample opportunity to explore the thrilling region that has been recently opened like the Gandaki Gorge, the deepest Gorge in the world. 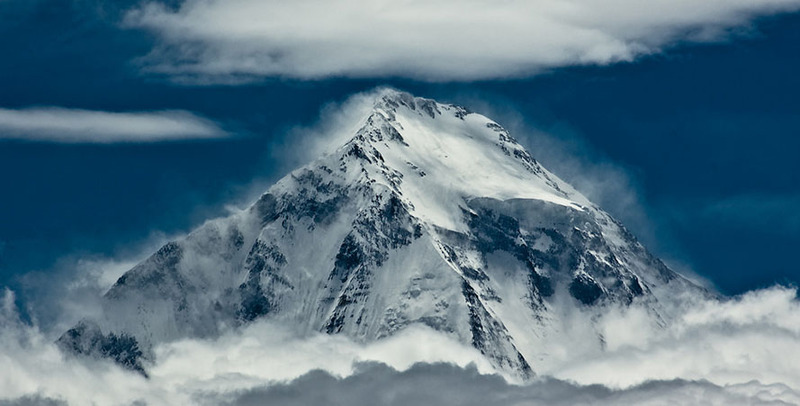 The seventh tallest peak in the world Dhaulagiri is also known as White Mountain as the Mountain remains covered with white snow all around it. 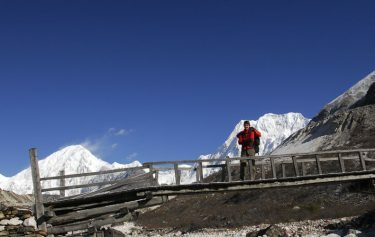 Dhaulagiri trekking is a challenging trek appropriate for those trekkers that has excellent physical condition and wishes to go to remote trekking area of Nepal following beautiful glaciers and crossing high snowcapped passes. 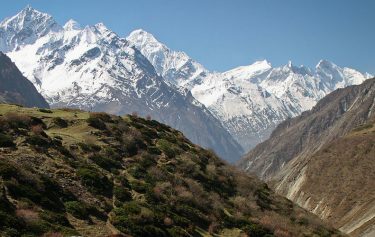 Dhaulagiri towers high above the well-trekked Muktinath pilgrim along the trail of the Kali Gandaki Valley and screens the hidden lands of Dolpo to its north, and western hills to the west. 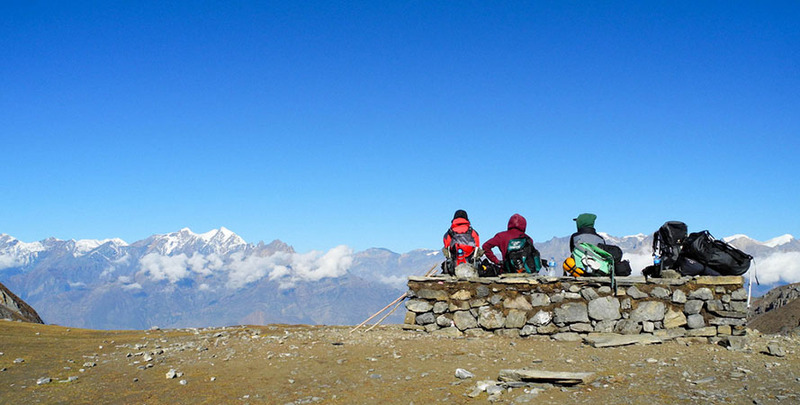 Dhaulagiri trekking offers unparalleled and impressing scenery along with very interesting indigenous people. The trek is interesting as we follow the rivers upstream, ferns and forests of oak, deciduous trees, rhododendron blaze and abundant other flowers on the trail. 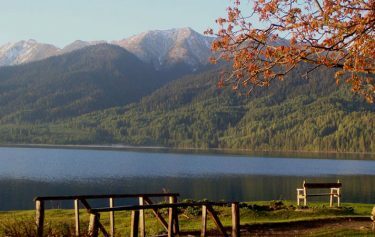 The popular high mountain passes include French Pass (5360m) and Dhampus Pass (5250m/ 17,220ft). Dhaulagiri Base Camp, French Pass, Dhampus Pass, Hidden Valley, Kaligandaki River Gorge, Annapurna Himalayan Range, Various ethnic groups. Day 03:Kathmandu - Pokhara - Baglung by bus (9h) - Beni (817m). Day 04:Beni - Babichor (950m) in 5h. Day 05:Babichor - Dharapani (1500m) in 6h. Day 06:Dharapani - Muri (1840m) in 6h. Day 07:Muri - Boghara (2080m) in 7h. Day 08:Boghara - Dobang (2880m) in 6h. Day 09:Dobang - Camp at 3200m in 5h. Day 10:Camp at 3200m - Italians Camp (3700m) in 3h30. Day 11:Italians Camp. Acclamatization and rest day. Day 12:Italians Camp -Camp at 4300m in 5h. Day 13:Camp at 4300m - Dhaulagiri Base Camp (4750m) in 4h30. Day 14:Dhaulagiri Base Camp. Acclamatization and rest day. 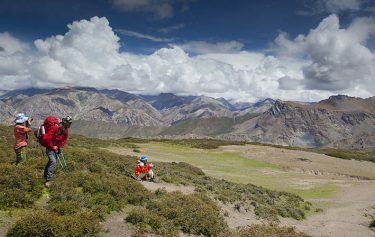 Day 16:Camp in the " Hidden Valley " - Thapa Pass (5230m) - Yak Kharka (4400m) in 6h. Day 17:Yak Kharka - Tukuche (2591m) in 5h. Day 18:Tukuche - Ghasa (2012m) in 4h30. Day 19:Ghasa - Tatopani (1189m) in 4h30. Day 20:Tatopani - Beni (817m). Day 21:Beni - Baglung in 3h, then bus to Pokhara. 3-hour walk.The trail the Kalihandaki River valley to Beni. Pleasant walk through the fields along Myagdi Khola Valley. Wonderful panorama over vast terraced field areas. We gradually climb up through fire tree forests. The valley narrows and villages become less numerous. Along the trail meadows give way to woods then terraced fields. 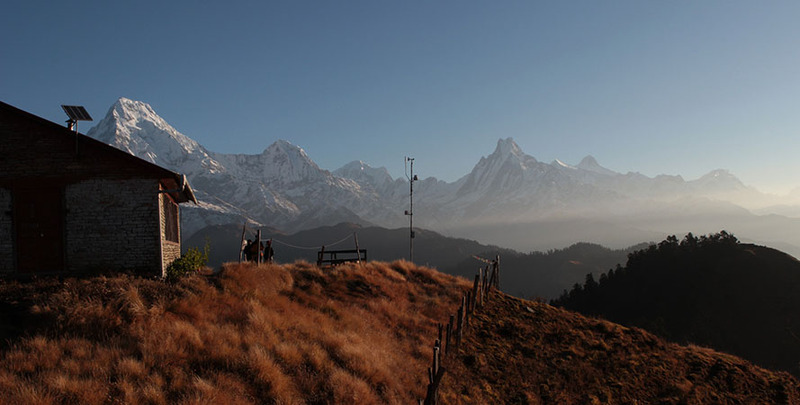 Great vistas of Dhaulagiri I (8091m), Gurja Himal (7193m) and Ghustung Sud (6465m). Up and down along the Myagdi Khola in an untamed setting: dense forest and impressive waterfalls. We continue up through a gradually-thinning forest. Our first meeting with the glaciers. 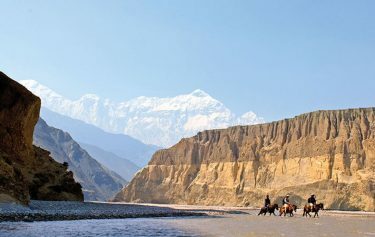 A magical panorama: just opposite, the impressive west face of Dhaulagiri I stares at us, on our right side is Manapati, and behind, the fantastic great wall of the Tsaurabong Peak. Day 11:Italians Camp. Acclimatization and rest day. By a steep trail, cluttered with moraines we approach the Myagdi Khola springs. We then start our progression along the Chhonbardan glacier. The climb is now easier. We establish our campsite opposite an ice-fall, set between Dhaulagiri II, II, IV and V on one side and Dhaulagiri I and the Tukuche Peak on the other. Camp in the " Hidden Valley " (5050m) in 5h. splendid view from the pass of Dhaulagiri I and the peaks surrounding the Hidden valley: Sita Chuchura, Mukut Himal et Tashi Kang. Yak Kharka (4400m) in 6h. A short climb takes us up to the pass. Magnificent panorama of the Annapurna massif and the Nilgiris. The path descends zigzagging along mountainside. 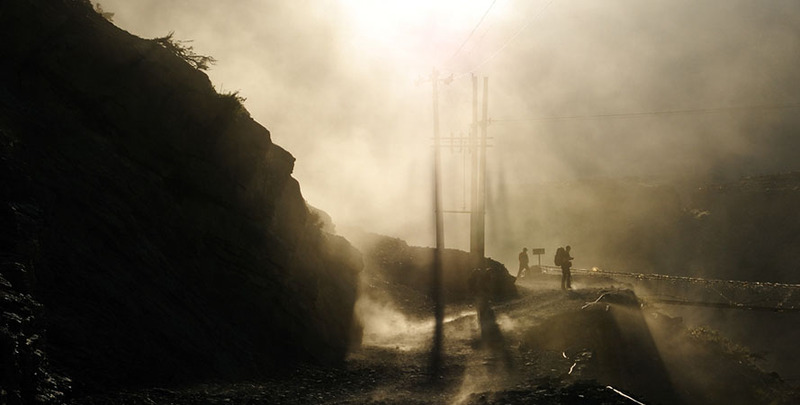 We follow the Annapurna circuit route, along the Kali Gandaki river. 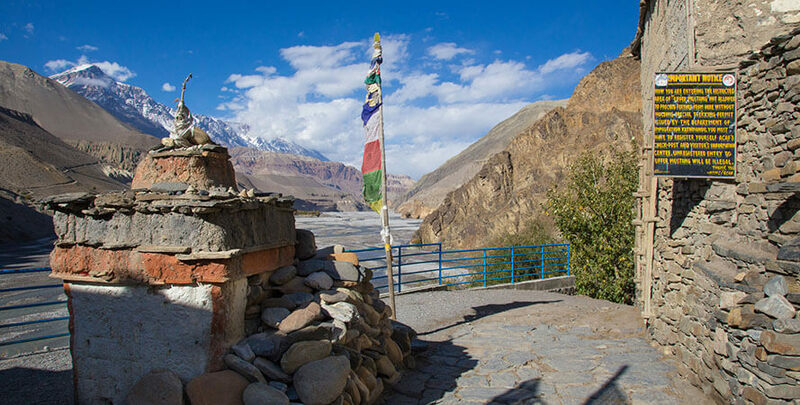 The trail now high above the Kali Gandaki passes through narrow gorges-regarded as the deepest and steepest in the world- and takes us to Tatopani - literally "hot spring". Tea House and camping accommodation during the trek with all the camping arrangment. Required numbr of porters including all expenses with insurence. Medince box , including Oximeter and pulse meter checker. Food and extra night at hotel and activities whilst in Kathmandu.